Africa is a haven for those looking to get away from it all. Boarding your very own double-seater plane and soaring above the African plains is the true definition of freedom and excitement. Traveling is, after all, as much about the journey as it is about the destination. During my long time living and working in Africa I had the privilege of escaping for weekend getaways to truly remote and fabulous resorts. In this article, I am sharing just three resorts that are not only stunning in themselves but also a great excuse to indulge in your own private plane, your personal captain or your own African journey. Take the roads less travelled and escape to paradise. Although Malawi is a landlocked country the Lake takes much of the country’s size. 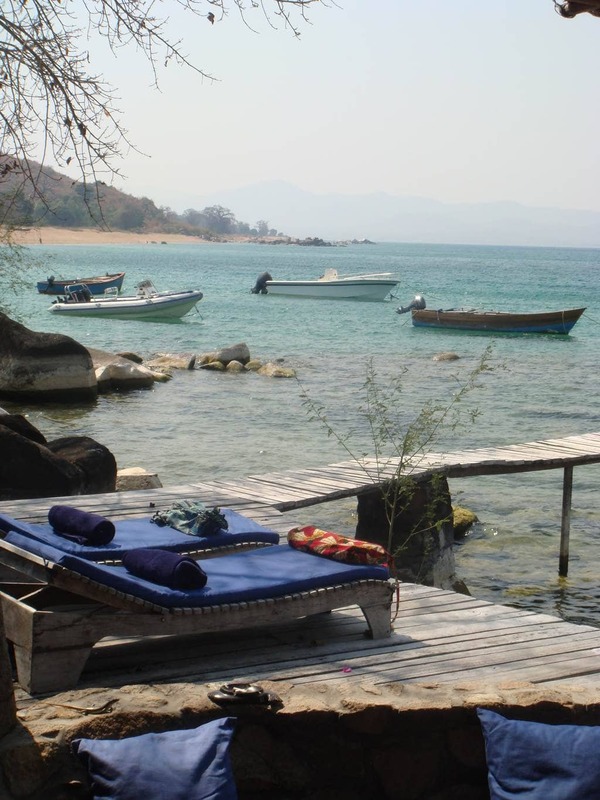 Located on the tiny Likoma Island in the middle of Lake Malawi is Kaya Mawa, a rock solid resort and the perfect way to end a safari in neighboring Zambia. Included in Conde Naste traveller Gold List for 2014 and chosen as one of the top-10 most romantic places by the same publication Kaya Mawa is becoming increasingly popular. Reopening after in-depth refurbishing in 2010 today’s rooms were designed in partnership with Katundu textiles, a workshop on the island created to empower single women. Their works are colorfully beautiful and I still keep the wrap around and sarongs that I bought on my trip. Most of the rooms are carved from large boulders and built around the impressive surroundings. They come with their own decks onto the Lake’s fresh water and with sun loungers to relax. The beach is dotted with baobab and palm trees, a very unusual landscape. The resort’s bar and restaurant are set high on the hill with beautiful views of the lake. The premium rooms feature outdoor pools, split decks and sunken baths. For a private family escape, the Ndomo 4-bedroom House comes complete with nanny, chef and other staff to tend to you every need. Because the resort is on an island with a lively population the beaches are filled with locals crafting canoes for fishing and children playing on the rocks. You can visit the local schools, the textile workshop or take a quad bike tour of the island. On Likoma, life happens jut like it did decades ago only now there are a bunch of tourists lounging on the beautiful resort. I found this immersion with the local ways of live a very invigorating take and a much more interesting way to travel. Visiting Africa tends to mean staying at a high-end resort and having little interaction with the locals. Kaya Mawa has this laid back girl-next-door feel that is so rare to find in the luxury businesses in the continent. 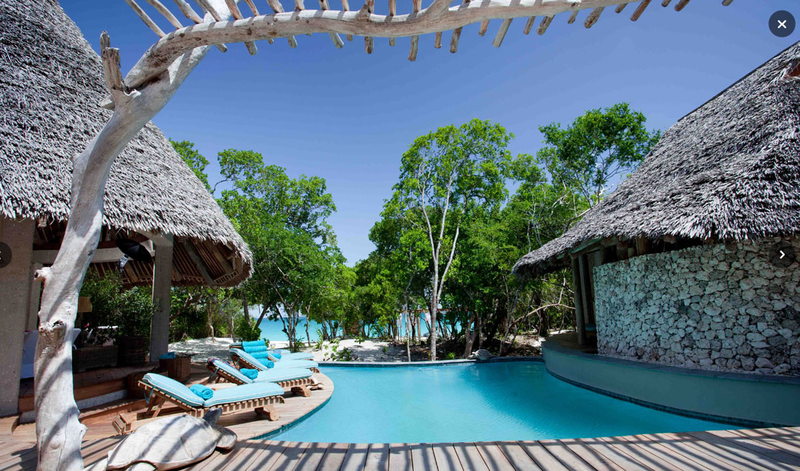 A resort tucked away on a remote island off the coast of Tanzania Fundu Lagoon is a well-established yet undiscovered haven in the tranquil waters around Zanzibar. Cabana style rooms are set on the beach with direct access to the sand and the cerulean ocean. The resort is all inclusive and entirely made of local materials. Although the island is not private this only adds to the charm of the resort. In the morning, you will see locals going about their daily life. Fishing from small dhows or carrying their wares along the beach. The resort blends perfectly into the surroundings, so much so that, from the boat, upon arrival, you may wonder where the hotel is as the huts are perfectly blending into the palm trees and vegetation. 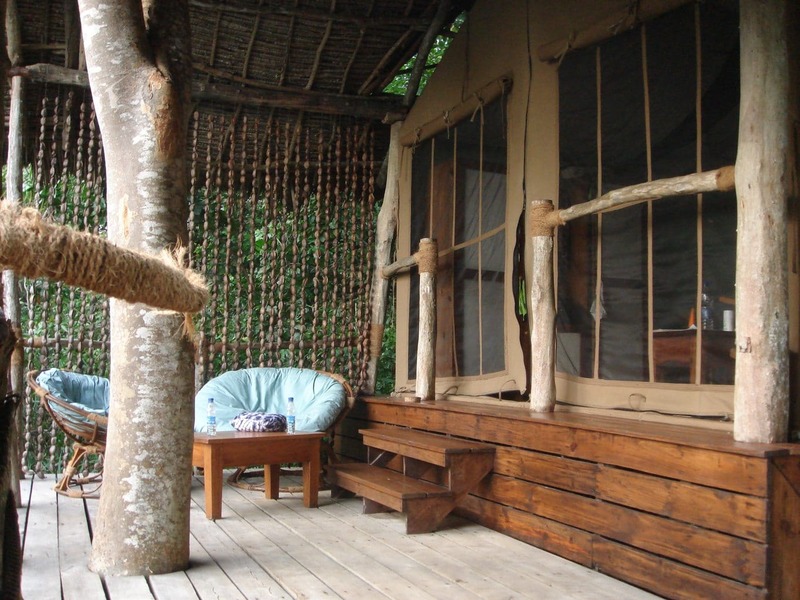 Architecture and design are African and rustic giving the resort a castaway feel. There is an elevated pool in which to relax and plenty of activities to participate in. The remoteness of the resort forces the chef to build menus from local ingredients, which is a blessing, as it features the freshest seafood and produce from East Africa’s bountiful garden. 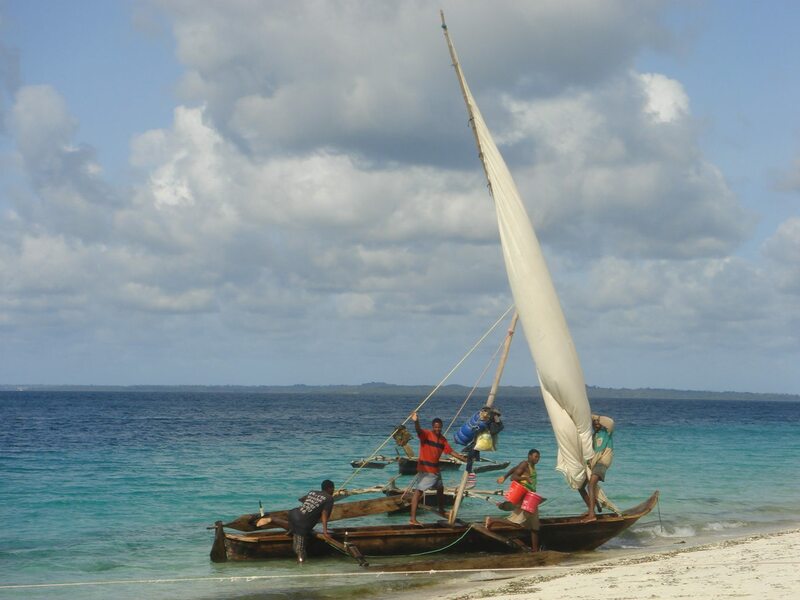 How to get there: Accessible only on a small plane from Zanzibar or Dar es Salaam, Fundu is a long journey away from civilization. You will take off from Dar, stop over at Zanzibar then land on Pemba Island (in Tanzania, not to confuse with Pemba in Mozambique) from where you will be picked up, driven to the harbor and then taken on a speed boat to the resort. From Dar es Salaam, budget around 3h for the journey. The resort can help organize everything as flights are not sold online. Bonus: Check out the underwater room at the Manta Resort also located in Tanzania. Coming out of decades of civil war Mozambique is fast becoming a preferred destination in the African beach circuit. Its untouched coastal towns and offshore islands offer pristine waters, white powdery beaches and exclusive luxury facilities. And you are unlikely to see many other tourists, if any, around. Vimizi tops the list, as of today, but watch out for several other options recently opening their doors such as the now Anantara-managed resorts on Medjumbe and Bazaruto archipelago nearby. Stay at the lodge or the private villas. The rooms are very large and the lack of mosquitoes means there is no need to waste time tucking nets under the mattress. Trust me, this is a gift not to be dismissed. The private villas feature their own chefs, 4×4 with drivers and all sorts of equipment for activities such as sailing or fishing. They all have their own swimming pools on the beach and are set on large grounds with guaranteed intimacy. How to get there: On a schedule plane twice weekly from the resort or on a private charter outside those days from either Dar es Salaam, in Tanzania, or Pemba island in Mozambique (accessible from Johannesburg or Maputo).